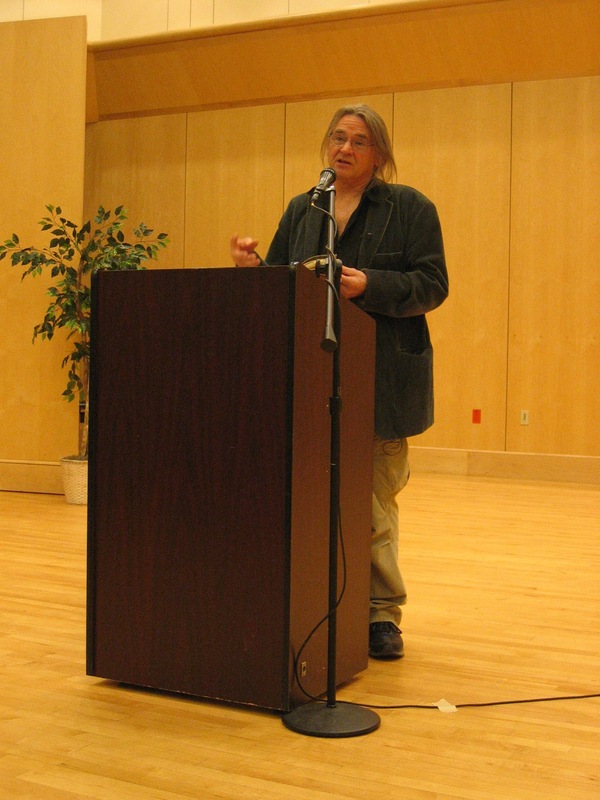 Tom Pickard opened his October 8, 2008 set for the New Writing Series with a poem still in manuscript paying homage to Robert Creeley. A track from Davis Schneiderman’s October 2, 2008, set for the New Writing Series. A track from UK poet Tom Raworth‘s performance in the New Writing Series on October 16, 2008. That’s our recording engineer Rebecca Griffin in the front row. Event Report On October 23, 2008, novelist Lydia Millet read to an audience of about 65 people in Neville 100 for the fifth event of the Fall 2008 season (see preview here). 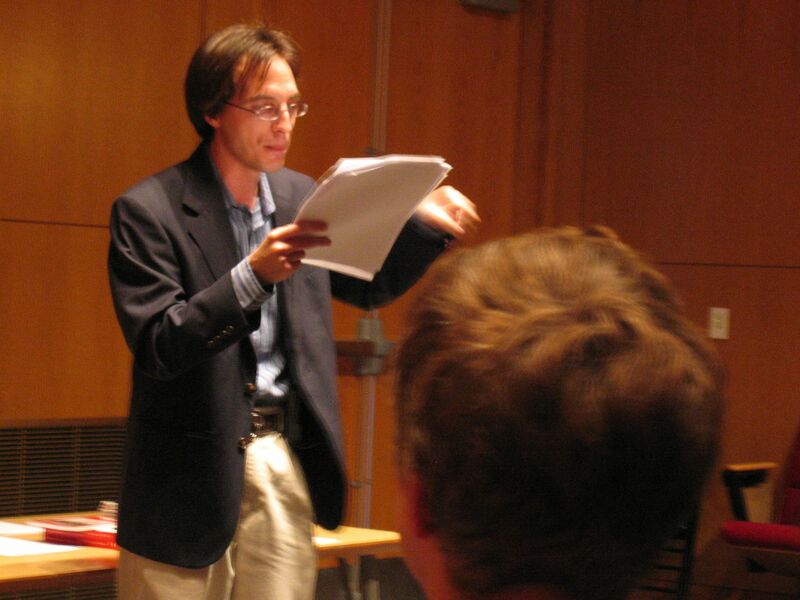 Dave Kress introduced the half-hour-long set in which Millet read from her novel How the Dead Dream, the first of a planned three-book series. Afterward, Millet fielded questions from audience members. Documentation An mp3 recording was made using an Audio-technical condenser Lo-Z AT835b microphone attached to a Marantz PMD660 Portable Solid State Recorder. The event was also recorded on digital video tape. Click images below to enlarge. 1] Does the main character [of How the Dead Dream] follow along the same sort of path as Milo from Catch-22? 2] Do you know the bit from Walt Whitman about turning to/ toward the animals? If so, does this mindset inform your writing? 3] Do you have children? 4] Is this book part of a series? 5] Do you find the themes of capitalism and money in your books particularly topical given the financial crisis going on currently in this country? 6] Do you find the money aspect or the animal aspect more preferable [in the context of your book]? 7] Did you know this book was going to be part of a series from the start? 8] Would you say your novels are more concerned with plot or with character? 9] Do you think you would write differently if you didn’t have the pressure of your novels having to sell well and be liked? 10] Do you fight with your publisher much about your books, and in particular that you wanted to write a series? 11] How do you find time to write? 12] Have you seen the publishing industry change over your career as a writer? 13] When you first started writing and publishing, how wide was your distribution? 14] Can you talk about your personal relationship with animals and how that affects your writing? 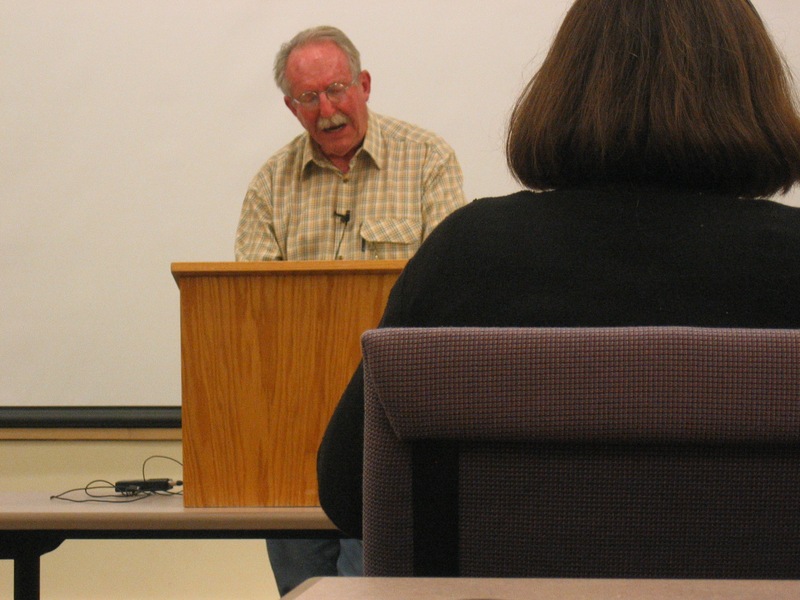 Event Report In the fourth event of the Fall 2008 season, poet Tom Raworth read to an audience of approximately 50 people in the Hill Auditorium on October 16, 2008. Steve Evans introduced the half-hour long reading, after which Raworth fielded questions and talked to audience members one-on-one. Documentation An mp3 recording was made using an Audio-technical condenser Lo-Z AT835b microphone attached to a Marantz PMD660 Portable Solid State Recorder. The event was also recorded on digital video tape. Click images below to enlarge. For the full photoset, visit our flickr page here. 1) Can you talk about the tempo/ velocity of your reading? Can you talk about the fact that you don’t introduce your poems? 2) Do you compose your poems as quickly as you read them? 3) Did your earlier style differ from your current style? 4) How long ago did you write “University Days”? 5) When did you come out with your first book? 6) When you write a poem, do you have a clear goal at the start? 7) How do you title your poems? The New Writing Series is delighted to welcome novelist Lydia Millet to the University of Maine for a reading on Thursday, October 23, 2008, at 4:30pm in 100 Neville Hall. The reading is free & open to the public, though seating is limited. Lydia Millet is the author of six darkly humorous novels: Omnivores, George Bush: Dark Prince of Love, My Happy Life, Everyone’s Pretty, Oh Pure and Radiant Heart, and, most recently, How the Dead Dream. Her third novel, My Happy Life, won the 2003 PEN-USA Award for Fiction. Her fifth novel, Oh Pure and Radiant Heart was short-listed for the 2007 Arthur C. Clarke Award. For more information about Lydia Millet visit her webpage. For the New York Times review of her latest novel, click here. On Facebook? Join the NWS groups here (local) or here (global). We’ve also recently started a flickr page here. The UMaine New Writing Series is cosponsored by the English Department and the National Poetry Foundation.